When I’d heard that Supermassive Games was going to be behind a point-to-point VR arcade shooter, I was immediately filled with images of a game like Time Crisis in VR. I had so much fun at arcades playing Time Crisis, and when I first played Bravo Team at E3 last year, I was excited for the possibilities it offered. Those possibilities were never realized as Bravo Team released and started firing blanks. From the early moments of the game it begins to stumble, and never recovers during the arduous and painful journey to the end. Immediately noticeable is how comically large my body was. In fact, everything about Bravo Team made me feel like I had a tiny head. I felt like my body, arms, and gun in my hands were just too large, entering the uncanny valley of bizarre proportions. For this reason, tracking never felt right. I used the Aim controller for the majority of my playthrough, and the gun always felt off in my hands. There was a floaty feeling to the gun I was holding in-game. My virtual gun kicked and jumped around more than the real gun vibrated, and aiming down the sights always put the gun at an odd angle instead of a position that felt natural. For that reason, I always hip-fired the gun, aiming by adjusting my stream of bullets instead of using the sights. It was often just as accurate if not more so, since raising the Aim controller anywhere near the headset threw tracking into a frenzy, so I kept my hands down when possible. 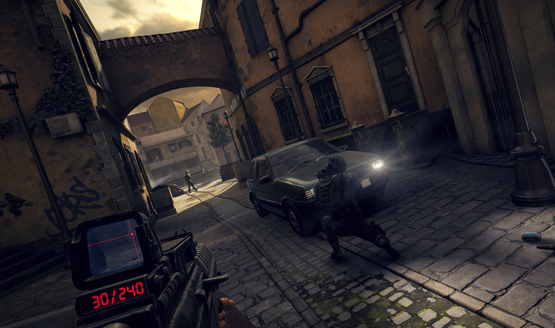 Movement in Bravo Team is handled similarly to on-rails shooters, except players get to choose their own cover points to run to. Supermassive “solved” the problem of possibility motion sickness by switch to a third-person camera for each of these cover-to-cover transitions. As often as I was moving throughout the game’s three hour campaign, this back and forth between first and third-person became jarring. It created a different kind of sickness as I was frequently forced in and out of my own head, forced to watch from sometimes two or three angles as I ran to each new point. Some of the camera angles the game switches to make no sense at all, and I often found myself staring at walls or random objects for no reason. Sometimes I actually ended up inside of them instead. Getting my bearings once I did arrive at the new point of cover always took some time. Getting downed by an enemy switches briefly to a third-person view, then back into first-person so I could lay there and shoot my pistol (facing the opposite direction of when I was standing), then back to third-person when my partner was reviving me. My sense of direction was constantly being screwed with and it made targeting and tracking enemies extremely difficult. It also takes too long for the movement animation to complete and give control back to the player, meaning that heading to the wrong cover position could invite death before I could do anything about it. VR developers have found a number of ways to have locomotion and movement in VR games without sickness, so this odd mechanic only serves to pull the player out of the experience. Suffering through all of these problems doesn’t even reveal an interesting shooter underneath. The story is generic and virtually nonexistent (I could sum it up for you in a paragraph, start to finish), the environments feel like they were pulled from every basic shooter ever, and the enemies are a seemingly endless sea of basic soldiers. There are only four weapons to use during the entire game, and two of them are reserved for the latter half. 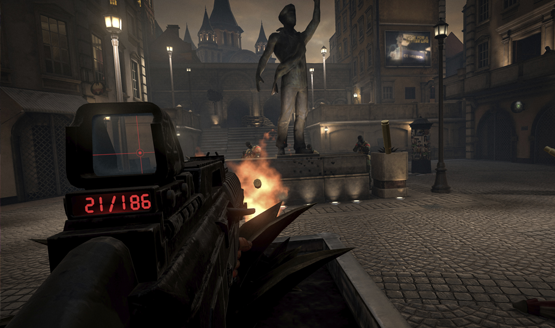 The sniper rifle is only used during two specific sections, and the shotgun has limited application with its short range. Enemies are bullet sponges though, and the spread of the assault rifle is far too inaccurate to reliably nail headshots. I burned through ammo faster than I came upon ammo crates, so I learned how to to use my pistol with infinite ammo to gain the upper hand in firefights. At times, it felt like Bravo Team was urging me to move forward, with waves of enemies constantly assaulting me unless I pressed to forward cover. Given the nature of the cover system, Bravo Team isn’t effectively designed to handle flanking enemies, or those who approach from the rear, yet it constantly threw enemies at me from odd angles. You can turn around with the left analog stick, but by the time I did, I was usually dead. There’s not much worse in a game than the feeling of a cheap death, and Bravo Team brought those in spades. The poor design also brings a number of weird graphical and AI issues. Enemies and my AI partner clip through objects, run into doors, walls, and cover, and there was even a set of doors I breached that was rendered to the side of where it was supposed to sit in the door frame. The graphics certainly aren’t the prettiest to look at, and watching rigid and disconnected animations of soldiers running between cover points and vaulting over (and through) objects really highlighted the lack of polish that Bravo Team got before release. One section has a mandatory jump between rooftops, and every single time (I died a few unfair deaths at this point), my soldier jumped through the concrete barrier dividing the rooftops, rather than pulling his legs up and over it. How was that missed during testing? In true Supermassive fashion, there are three different endings, but don’t expect the butterfly effect decision trees of their other titles. One choice near the end is simply go left or right, and the other is to choose whether or not to kill a specific individual (a decision only offered when choosing one of the two directions). You can actually just replay the final chapter of the game in order to view all three endings, but honestly, they’re nothing special. It ultimately results in the same concluding scenario with some minor dialog variations. Trophy hunters will have to pursue all three for Platinum, though. Speaking of the ending scenario, it is one of the most trying tests of patience I’ve had in my time gaming (so, in my life). As I made my way through the area to the final goal, enemies would appear behind me as I pushed forward, killing me before I even had a chance to react. The AI partner I was playing with was extremely dumb and got himself killed regularly. At one point, he revived me but the screen stayed black and white as if I were dead and I was unable to do anything. I had to quit the game and replay the entire chapter up to this final area. It was a culmination of every problem that I had with Bravo Team, effectively sealing my opinion of the game. If you enjoy the self-torture, it’s possible to find some replayability and fun in Bravo Team with the Score Attack mode and online co-op gameplay, but both of these are filled with the problems that are baked into the core of the game. You’ll still need to deal with the disorienting movement system and terrible aiming and boring weapons and game design, but you can deal with it with a friend–or random–online, or while chasing some high-score number, which can ultimately make a game moderately more appealing in spite of its issues. 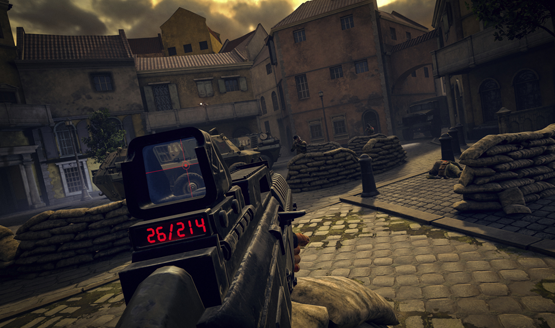 Bravo Team’s third-person camera movement system snatches control away from the player far too much, creating a jarring and unfriendly experience. I’m still baffled at why this was thought to be a good idea after numerous play tests. Movement is just the peak of myriad problems in Bravo Team, including tracking issues, AI goofs, and just plain bad and boring game design. Endless waves of bullet-sponge enemies in one boring location become more endless waves of enemies in another boring location, and dealing with Bravo Team’s other issues means it’s not even a boring waste-of-time type of shooter. It’s altogether a bad game with few redeemable aspects that doesn’t represent the best of VR or Supermassive and should be avoided at all costs. Bravo Team review code provided by the publisher. Version 1.01 reviewed on a standard PS4. For more information on scoring, please read our Review Policy.